Congratulations to Christie Serritella on winning our thirty seventh High Five Giveaway and thank you to all who entered! 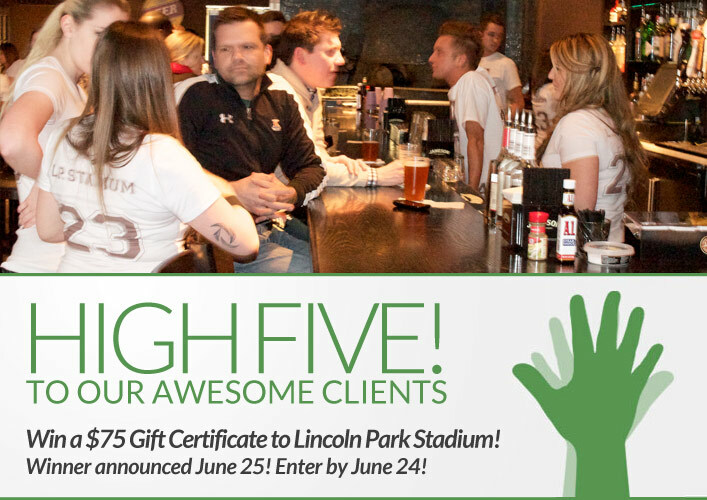 Our next giveaway is for a $75 gift certificate to Lincoln Park Stadium. Lincoln Park Stadium​ ​was created to be the perfect place to gather; enjoying games, food, drinks, and the company of friends on any given day.​ Like most stadiums, there aren’t any bad seats in the house. With 18 large, hi-def TVs ranging from 65 to 80 inches, you can view and enjoy your team from any seat. The servers check on you frequently and rooting for your guys is encouraged. Lincoln Park Stadium is located at 2423 North Clark Street. Visit their website at lpstadium.com or call them at 773-661-9710. Each Wednesday we donate $1, equal to 8 meals, from your visit to Feeding America to help feed those in need. How many meals did you help us donate this past week? Now, just add a comment to this post with the right answer to be eligible to win! The winner will be announced on Tuesday, June 25. Entries must be received by midnight on Monday, June 24. This week you provided 456 meals! Thank you! Last week it was 456 compassionate meals!